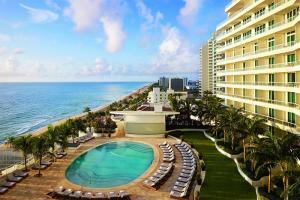 Discover one of the most beautiful luxury hotels to grace the Florida Gold Coast at The Ritz-Carlton Fort Lauderdale. The hotel's magnificent beachfront location invites guests to savor a voyage of quiet relaxation or thrilling adventure. Spacious guest rooms are havens of relaxation, with luxurious appointments, beautiful bathrooms, plush bedding and thoughtful amenities. The restaurants highlight the area's scenic beauty and its culinary bounty. Burlock Coast's menu highlights locally sourced ingredients, while the Poolside Café offers a front-row seat to the majestic Atlantic. The spa offers an array of services and indulgent treatments inspired by the sea. Fort Lauderdale-Hollywood International Airport is 6 miles from the hotel.